Abstraction is likely one of the most misunderstood techniques in design and fine art. In general, it’s confused with anything that’s non-objective, modern, postmodern, non-traditional, or just plain weird. It’s true that abstraction is not directly representational, but it’s also not a catch-all word to describe anything we don’t quite know how to categorize. However, if you understand it in the right way, you can increase the effectiveness of your design and art through abstraction techniques. You can increase the effectiveness of your design and art through abstraction techniques. Abstraction is not a style. What we call abstract art includes many diverse styles and movements. For example, the work of Henri de Toulouse-Lautrec is abstracted, because he stylized his figures and scenes. And although Jackson Pollock is often referred to as an abstract artist, he was non-objective. If you study art and design history you’ll note that artists and designers are identified by their unique styles. Almost every representational painter has abstracted a bit, and we can point out certain characteristics in their technique and treatment of shape, line and color that makes their work specifically their own. Abstraction is a design technique that, when used well, can be a powerful means for communicating visually. A correct understanding of the concept gives us the ability to use abstraction to strengthen our design abilities. The use of abstraction can make things more interesting and engaging. The word, abstract, originates from the Latin, abstrahere, which means to draw away from. When we abstract, we begin with something and move away from it, yet remain connected to it. Abstraction, by definition is the distortion or enhancement of elements in an image or form. It is based on a representational capture or depiction which is then simplified, exaggerated or otherwise stylized. Abstraction represents things and people, but is not an accurate depiction. Think of it as a means of deliberate alteration or manipulation of shapes and forms for a specific purpose. It’s based on reality, but does not directly represent it. So let’s back up for a moment. What is representational, or objective, form? It is the depiction of actual form in a realistic manner, close to the truth with very little departure. Rembrandt is a great example of a directly representational painter. Jeremy Lipking and Gregory Mortensen are modern-day masters of realism. In design and art, abstraction is the modification of representational forms. We reduce a shape to a more simple shape, but still maintain connection to the actual thing. Simplification and stylization are methods of abstraction. Although they are connected, we need to differentiate between abstraction as a stylistic interpretation and abstraction as a design approach. Abstraction as a means of creating design and illustration goes well beyond one’s personal style or aesthetic. It becomes the means for effective visual communication. Abstraction is often the best vehicle for communicating an idea or concept. As a design approach, abstraction allows us to focus on the various shapes, shape relationships, colors, lines, directions, rhythms, etc. that make up a design. It is a way of unifying different forms within a design and calling attention to visual cues and messaging. The process of abstraction compels us to carefully observe and analyze what we see, paying attention to how something is formed and how we can reform it for our own purposes. We become more aware of the parts, their relationships within the design space, and how everything comes together to express the whole design. There are degrees of abstraction. Alphonse Mucha used elongated forms, slightly simplified shapes and emphasized curves to create visual movement (rhythm) in his designs. JC Leyendecker contrasted straight and curved contours in his figures. 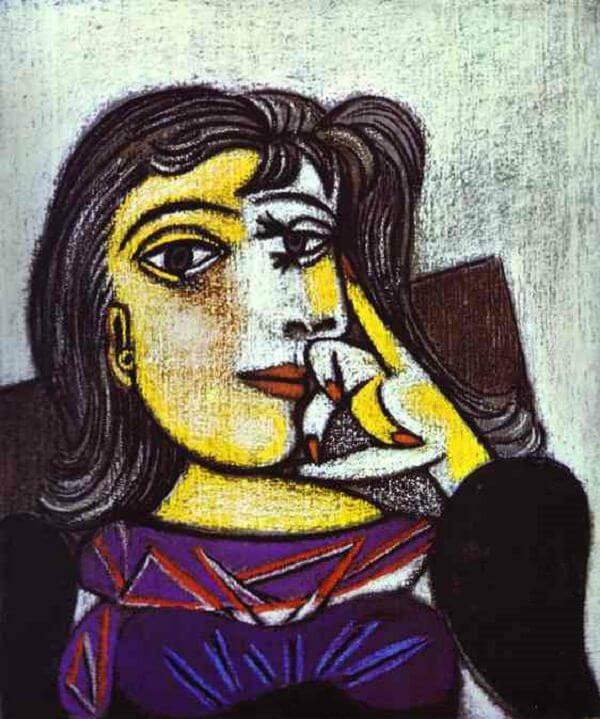 Pablo Picasso explored multiple views from a single point of view and used arbitrary color in his analytical cubism. Keith Haring maintained the idea of the original form, but took things to a state of simplest expression, using shapes filled with flat color. Acura’s logo includes a stylized caliper, a tool for accurately measuring thicknesses. It suggests the form of an uppercase A. The caliper shape is enclosed in an irregular oval (not a circle or round-cornered square). The logo’s icon communicates precision and exceptional quality, which is the messaging of this luxury auto brand. While abstract forms are directly derived from and remain visually connected to the actual forms they derive from — we see what is represented — non-objective forms are not altered appearances. They are shapes for shapes’ sake. A letter form, for example, may symbolize a phonetic sound, but it is a non-objective shape. Non-objective forms do not rely on how objects actually appear. Instead, they may be geometric, rectilinear, curvilinear or irregular. The key is that they don’t represent any object. They are not object-ive. Direct representation can be rote and too familiar to make an impact other than show of the rendering skill of an artist or designer. The deliberate use of abstraction can make a design more engaging. Sometimes tweaking things to make them fit or work together more comfortably is necessary. By manipulating shapes and modulating color, you can suggest mood and ambience. For example, use a limited cool color palette and elongated shapes to convey a sense of depression and withdrawal. The use of rounded shapes and warm colors can convey a happy, upbeat mood. To communicate an idea or concept. Combine two or more unrelated objects into a new forms for startling effects and to drive home an idea or concept. When exploring ideas, develop awareness of how basic shapes are at work in the forms you are drawing. Observe the overall shape of the total form. Abstract shapes form the structure of your drawing, and help you understand how all the parts are fitted together to form the whole. Spend some time during your drawing sessions to construct forms starting with core directional lines and then adding larger loosely connected shapes. Then add smaller shapes as transitions between larger shapes. You’re invited to accept our Abstraction Challenge in the Eye Level community on Facebook. In this challenge you’ll explore 5 ways to create abstracted designs. Visual artists, designers, 3D artists and photographers will all benefit from the process. To join the community, subscribe to the Eye Level email list. The link to join my private Facebook group will be sent to your inbox.